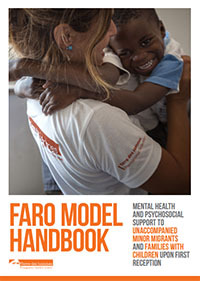 The handbook, ‘FARO Model Handbook: Mental Health and Psychosocial Support to Unaccompanied Minors and Families with Children in Reception Centres‘, is based on a multilevel system of intervention, responding to migrant children’s needs depending on where they arrive (hotspots, harbours, reception centres etc.). The handbook accurately describes the ways of working and main challenges and difficulties facing project staff in providing the specialised treatment some children and families need. 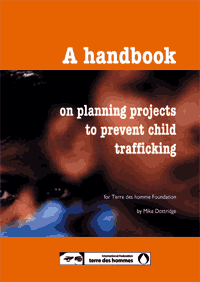 In the handbook also contains real-life cases and technical sheets with examples of psychosocial activities. The handbook can be downloaded in Italian and English. Terre des Hommes Italy published this guide in order to provide adequate assistance to migrant children arriving by sea. The purpuse is to provide children with qualified support and enable them to understand and accept the reasons of their migration. The guide aims to highlight the complexity of the needs of unaccompanied migrant minors and propose useful contributions to the Implementation of measures that go in the direction of offering psycho-social support to these children. 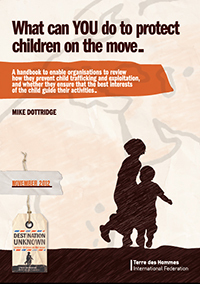 “What can you do to protect children on the move” is an handbook designed to help organisations to review any activities they organise concerning children who leave home and to enable them to question the ways they have worked in the past, opening up the possibility of using new methods to benefit “children on the move“. It is not intended to be a training guide but instead should be used to help project workers, their managers and organisations to identify areas of further capacity building that may be needed. The primary purpose of “(Re) building the future” is to expand on project workers” understanding of how to help trafficked children. 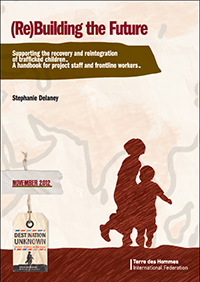 The handbook seeks to explore the principles underpinning work with trafficked children and to examine the main processes involved. Consideration is also given to the dilemmas that may be encountered and issues that workers should keep in mind as they work with trafficked children.